Bay Area IM Vinay Bhat just scored his third norm in Spain (details forthcoming) while Emory Tate defeated German GM Jan Gustafsson in the Curacao Chess Festival and has a 2600+ performance with 2 rounds to go. Emory who is normally proud and vocal about his GM scalps, was understated about yesterday's victory, because he got lucky. Jan suddenly got mated with an extra two pawns in a study-like endgame. Today Tate plays Alexander Shabalov, who Emory defeated in a spectacular game last year in the Dragon. Unsurprisingly, Shabalov switched it up this year and played his specialty, the Sveshnikov. Here is last year's game. Click here for Round 8 pairings and scores. Emory famously calls himself the "greatest tactician in the World." As for strategy, he jokes that he is working on becoming the world best at that. Tate is bothered by opening theory that stretches to 20 or 30 moves, and told CLO his "frozen pawn" idea that he came up with during this trip. In each game, both players would have two pawns frozen for the first ten moves. Neither player would know which of their opponent's pawns were frozen and the "I still haven't worked out all the details" Emory says. Chess is always in need of innovative ideas, so feel free to try out frozen pawns (which certainly sounds cool) and report back. GM Jan Gustafsson from Hamburg, Germany. Emory Tate plays Alexander Shabalov in a Curacao rematch. There is a children's tournament alongside the main event. 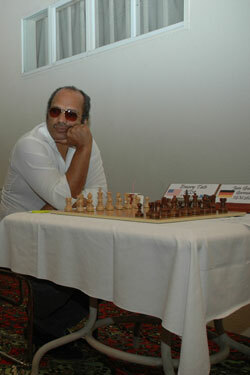 Word on the chess circuit is that Vinay Bhat earned his final GM norm in Spain. CLO will confirm with details as soon as possible.